Rover is a company that was created to help assist dog lovers in getting care for their pets. Using the Rover app or Rover.com you will be instantly connected with dog sitters, walkers and visitors in your area so you can easily get help with your pup. If you are planning a vacation, need a dog walker while you’re at work, or just need someone to pop in to check on your dog during the day, Rover has got you covered. Now offered in over 14,000 cities across America and Canada, Rover also has over 200K dog sitters and nearly perfect reviews. Use my link to get a $20 Rover credit! Just because Rover offers all of these options, does not mean you have to do them all. You get to pick and choose which types of services you offer. When I first started being a dog sitter through Rover, I signed up to board dogs overnight and do doggy daycare during the day. Recently I decided to offer more services. On top of doggy daycare and boarding I now offer, drop-in visits, and dog walking. Because we have 2 dogs of our own, I originally started with one sitting one dog at a time. Now that I have grown more comfortable with the process, I decided to change my profile to allow more dogs. On top of our two pups, I will now care for 2 additional dogs at one time. As soon as I offered more services and more dogs I received messages from people requesting my services. Even if you are not big into dog walking or drop in visits, offering these can be a great way to meet dog owners. I had a family request for me to walk their 2 dogs for a weekend. For over $200, I was more than happy to meet with them! After meeting with them, they started booking more days for dog boarding. Just by opening up my availability a little bit I already have more dog sitting and money making opportunities! Click here to get started dog sitting today. After I applied online, I made to sure watch Rover’s welcome videos that talked about how to be successful with Rover’s dog sitting services. Here are some of the best tips that I implemented that worked wonders for me. Accept first bookings – I made sure to start using Rover during a time when my calendar was wide open. Accepting your first few bookings will help you get better reviews and increase your chance of people finding you. Keep prices competitive – When I first started out, I used Rover’s recommended prices. Because I wanted people to select me over other sitters they might find, I did my best to keep my prices competitive. Request reviews – Before I even dog sat through Rover, I asked a few friends whom I had dog sat for to leave some positive reviews on my profile. This is very reassuring to potential clients. After you have booked through Rover, give a friendly reminder to your clients to leave a review for you as well. Keep an open calendar – As I said, when I first signed up for Rover I made sure to have plenty of time available in my schedule. Keeping an open calendar will present more opportunities for people to take advantage of your dog sitting services. Create a solid profile – Be super informative when creating your profile and be sure to add lots of pictures! People who will be reading your profile are most likely dog lovers, so if you have photos of your own dogs, make sure to share them! Ok, so we know how to get started smart with Rover, but what are some things that you can do to get those good reviews? How can you be one of the best dog sitters or dog walkers out there? Send pictures – Just like kids in daycare, dog parents like seeing photos of their pups snuggled up or having fun. Be flexible – A lot of times I get last minute bookings so I make sure to be patient and flexible as people try to get their plans in place. Meet in advance – If you’re able to, offer to meet potential clients in advance so they get a chance to know you and feel comfortable with you. Check in with any questions – If a dog is walking funny, or you find something in their doggy bag (haha) that you aren’t quite sure about, feel free to reach out and ask. You want to make sure you are giving each dog the best possible care and people most often appreciate that you are taking the time to reach out. Praise them – Let each family know how much you loved their dog. Tell them specific fun times you had or silly things that their dogs did that made you giggle. Respond quickly – In order to make sure you get a good review and are getting as many bookings as possible, it’s a good idea to download the Rover app. It syncs to your phone so when someone messages you on Rover, you will receive a text message right away! What if you have dogs of your own? Let the dogs meet on “neutral territory” like at a nearby park. Put your dogs in a separate room when your Rover dog first arrives. Introduce your dog(s) on a leash so you can control any big reactions that might happen. Plan for dogs not getting along. Sometimes we’ll end up leaving one of our dogs in our room during another dog’s visit if they don’t seem to get along. Give your Rover dog a separate area to eat in order to prevent food fights. Always keep your Rover dog on a leash when outdoors. This is not only a Rover must-do, but it also helps keep you in charge. How often do you make money? Put simply, you will make money as often as you book and complete a dog service. The more you implement the tips above, the more like you’ll be to get bookings and get paid! When I first started Rover, I kept Rover’s recommended prices. After taking on several different dogs and getting a good feel for how things run, I decided to up my prices just a little. Originally my prices were rather low, so I bumped them up another $5 or so. While I do want to get paid for my services, it’s important to remember not to price myself too high. I have Rover set up through my PayPal account. Once a dog visit, or dog walk has been completed, Rover will issue a payment to me through my PayPal. Does Rover get a commission? Yes, in order to operate, Rover takes a small commission from each of my bookings. This is part of the reason why I upped my prices a little. I, of course, don’t mind Rover taking a commission because, without them, I wouldn’t be finding all of these bookings anyway! What if you have “bad” dogs? I like to get as much information as possible about each dog so that I can know what to expect. If there is a dog with potty problems, I know about it in advance. When a dog needs medication I make sure to get all the information first. People are pretty open about their dog’s problems because they want you to have a positive experience as well. So far, the biggest problem I have had with a dog was that they wouldn’t stop barking. Just make sure to ask if there are any problems or any concerns that the family wants you to be aware of. That way you can handle any issues that might arise. You can sign up for Rover quickly and easily online. Because people want to know their dogs are in good hands, each potential sitter must pass a background check. My application process took only a few days and I booked my first dog in about 20 minutes! Just make sure you are checking your e-mails for updates and get all the steps done as soon as possible! My kids tell me every day that they love my “job.” Although it has never actually felt like a job. 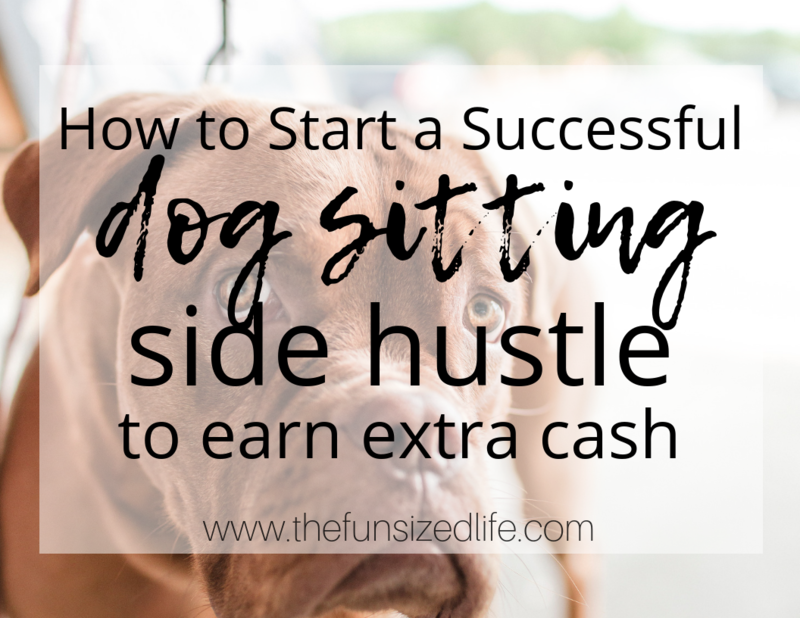 Hopefully, this post was helpful in answering some of your major dog sitting questions and getting you totally psyched up for joining Rover. You won’t regret it, I promise.